One of our favorite things to do when we have a particularly interesting or high-quality ingredient (or combination of ingredients) is to create a three-way tasting menu of dishes featuring that ingredient in multiple ways. It’s a fun, creative way to get the most out of something that might be a little special or unique, or just something we really love. Recently, I had the opportunity to do our weekly produce shopping at the Union Square Greenmarket in Manhattan. Because we live on Long Island we don’t get to there often, so if the chance arises I take advantage of the situation and make sure to pick up at least 2 or 3 items that I couldn’t normally get out here in the boonies. On this last trip, among other goodies, I bought a smallish kabocha squash, and having never tried it before we decided to use it as the focus of one of our tasting menus. 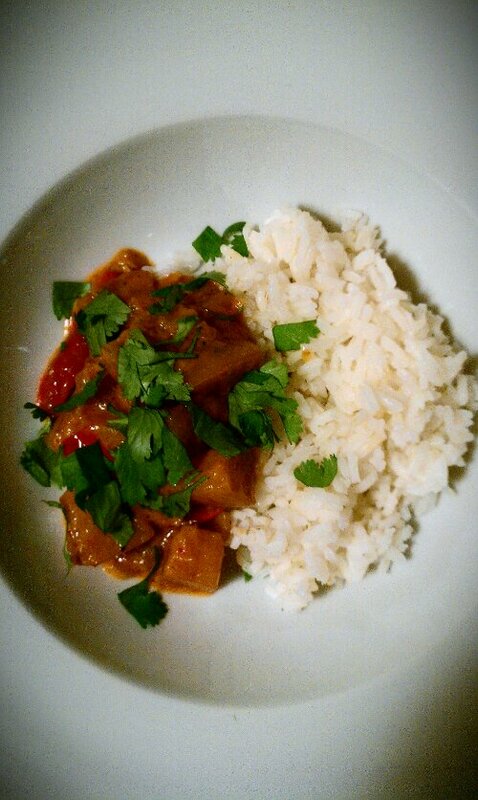 First course was a Thai red curry with kabocha, bell peppers, and onions. Made with fiery red curry paste and coconut milk, the sauce nicely complemented the subtle sweetness of the squash, though I have to admit I couldn’t finish my portion – it was just too spicy! 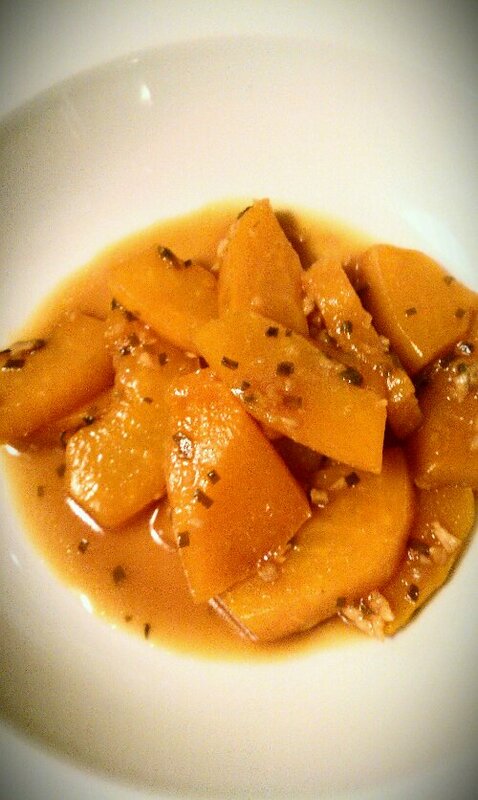 Second course was Japanese-style soy-braised kabocha with toasted sesame seeds and scallions. I absolutely loved this – the squash turned velvety and luscious in its lightly sweet and savory braising liquid, and its unique earthy flavor stood out more than in the curry. In retrospect, this should have been our first course – the more subdued flavors would have worked better as an opener than the super-spicy curry did. I definitely intend to make this again though, possibly even with other varieties of squash or pumpkin, as part of a full Japanese meal. 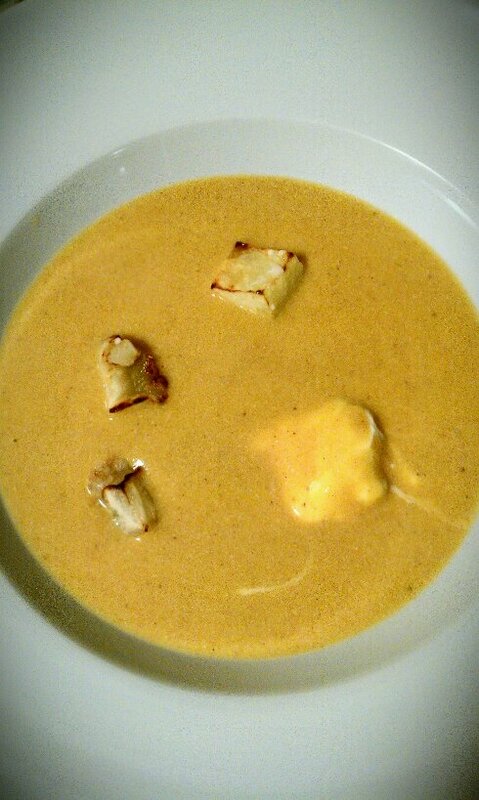 Last course was a contemporary American-style kabocha bisque with caramelized apples and Greek yogurt. This was another winner, with the tender caramelized apple chunks adding texture and toasty, tart sweetness to the creamy, savory, cinnamon-spiked soup. If we made this again, I’d use a lighter chicken stock than the one I had on hand (a roasted bone stock I’d made and frozen a few months ago) which was a bit too flavorful and overpowered the delicate squash a bit. I’d also try to finesse the caramelized apples, as they were a bit too soft and a bit too few. I wished I had at least twice as many pieces in my bowl! This meal really made me wish that kabocha was more readily available in my area. Most winter squashes do taste similar, but the kabocha had a delicate honeyed sweetness and almost melon- or cucumber-like aroma that I found really intriguing, and a lovely smooth texture when cooked, quite unlike the butternuts, acorns, and sugar pumpkins we’ve been cooking for years. It just emphasizes the importance of trying new things and adding a little variety to your kitchen, even if its just one new variety if an ingredient you’re already familiar with and fond of. There’s a whole world of new tastes and textures out there, you just have to seek them out when you can! This entry was posted in Food, Drinks and Cooking and tagged asian, curry, dinner, Japanese, one ingredient three ways, soup, squash, tasting menu, Thai, vegetables, vegetarian. Bookmark the permalink.